The Intimidator is ideal for eliminating trees, saplings, shrubs, rocks, bushes, and other obstructions on the job site or farm. 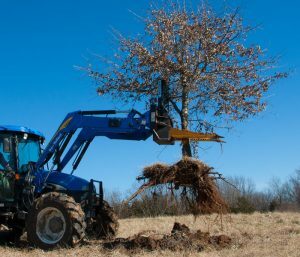 The unmatched versatility of the Intimidator handles the toughest stumps, posts, rocks, fencerows, and land-clearing jobs. The Intimidator incorporates a tree/post puller, stump bucket, and rock picker all in one. The uniquely synchronized jaws, designed for less wear and tear on the vehicle, are actuated by a rear-mounted, fully-protected 3” diameter cylinder. Two jaw options available, smooth side or side saw tooth (cut off trees and aggressively excavate roots with bidirectional teeth). Lower operating costs than a bulldozer and less work than a chainsaw. Intimidate your job with the Danuser Intimidator. Ask your Midland representative for more information and pricing. Learn more here.